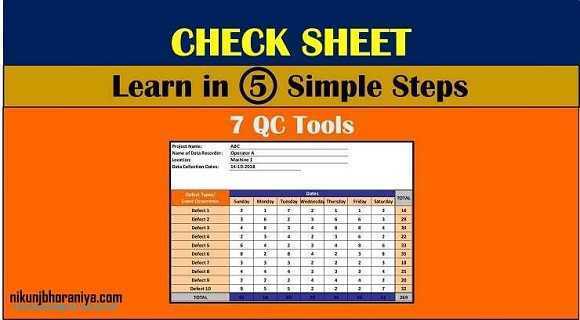 Check Sheet | What is Check Sheet in 7 QC Tools? Home7 QC ToolsCheck Sheet | What is Check Sheet in 7 QC Tools? 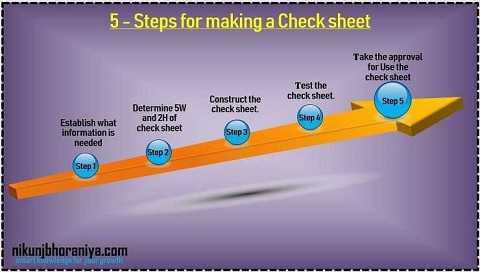 Check Sheet | Tally Sheet | What is Check Sheet in 7 QC Tools? 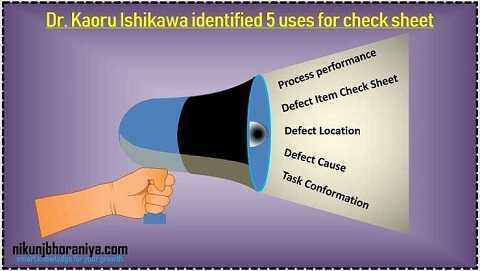 → Check Sheet is a systematic method of collecting, recording and presenting the relevant data in a simple manner. → It can collect qualitative and quantitive data also. → Sometimes it is also called as a tally sheet. → It is a good tool of a Seven Basic Quality Control Tools. Establish what information is needed. Take the final approval for Use. → Define what information is needed? → Why is the data needed? → What type of data collection is required? → How much data is essential? ➝ CheckSheet has three types of information. Name of the project/ problem theme. Name of the person recording data. Then Column/Raw to record frequency. And Column/Raw to record total. ➝ Test the Sheet with at least three different collectors. ➝ Reconfirm that the columns/ rows are relevant and required. ➝ Check if the Sheet is easy to record and use. ➝ Make changes based on the feedback. ➝ Explain the use of this sheet to the data collector. ➝ Ensure that the data collector understands the reason for which the data is being collected. ➝ Standardize its use to assure consistency. ➝ See below example of tally mark = 5.
Who will fill the data in sheet? Why the data is to be collected? ➝ The CheckSheet is also called as a tally sheet. ➝ The example of the tally sheet is mentioned below. ➝ The example is given below. 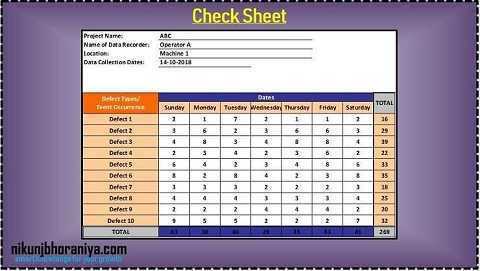 ➝ By using CheckSheet we can make data gathering simple, systematic, easy and effective.